To see more things to do, ratings, and more tourist information, refer to the Neil Island trip planner . New Delhi to Neil Island is an approximately 8.5-hour flight. Traveling from New Delhi in March, expect somewhat warmer with lows of 28°C in Neil Island. Finish your sightseeing early on the 2nd (Sat) so you can travel to Havelock Island. Get outdoors at Radhanagar Beach and Elephant Beach. There's lots more to do: see some colorful creatures with a scuba or snorkeling tour, tour the pleasant surroundings at Kalapathar Beach, and head outdoors with Captain Hook’s. To see photos, traveler tips, more things to do, and more tourist information, read Havelock Island trip itinerary maker tool . Explore your travel options from Neil Island to Havelock Island with the Route module. In March, daytime highs in Havelock Island are 38°C, while nighttime lows are 28°C. Finish your sightseeing early on the 5th (Tue) to allow enough time to travel to Port Blair. Step out of the city life by going to Ross Island and Corbyn's Cove. There's still lots to do: don't miss a visit to Cellular Jail, see the interesting displays at Samudrika Marine Museum, identify plant and animal life at Chidiya Tapu, and step off the mainland to explore Jolly Buoy Island. For photos, traveler tips, where to stay, and tourist information, use the Port Blair vacation planning app . Drive from Havelock Island to Port Blair in 3.5 hours. 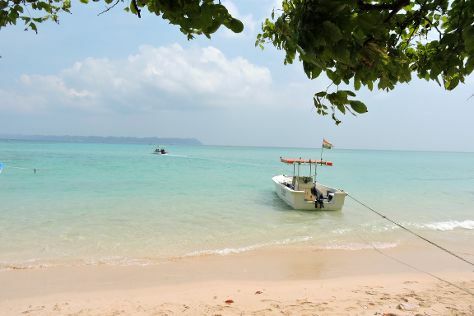 Expect somewhat warmer evenings in Port Blair when traveling from Havelock Island in March, with lows around 34°C. Finish up your sightseeing early on the 8th (Fri) so you can travel back home.